This view is looking East from the South side of Main Street (now Lakeshore Drive) in front of the Lakeshore Drive United Church, just west of the Hwy 2 & Hwy 31 intersection. 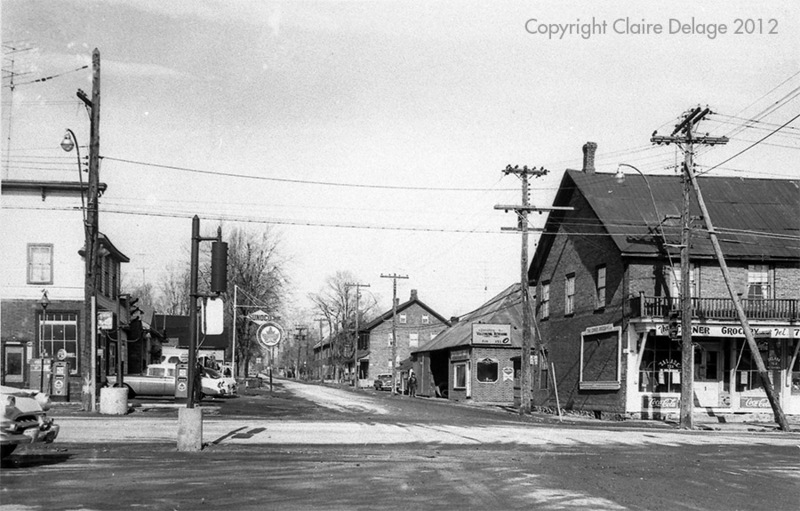 It shows the Falcon Inn owned by Lorne Kinkaid and downtown in the distance. The South side of Main Street looking East just West of the Hwy 2/Hwy31 intersection with the War Memorial at the intersection. 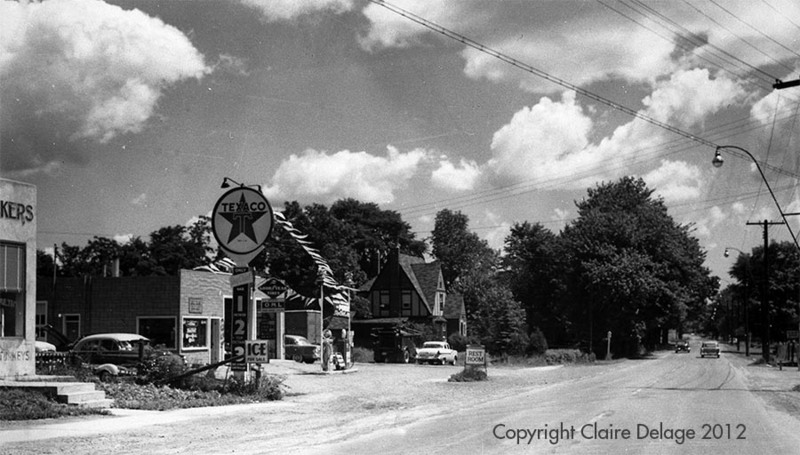 This photo shows the Texaco Gas Station owned by Arthur Edgerton. 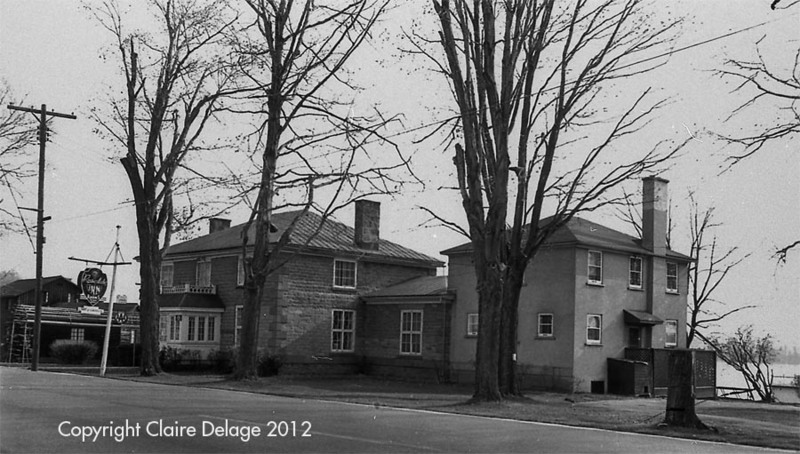 At the right is the home owned by Colbourne Hess. HP29: Main Street Looking East at the Corner of Hwy 31. 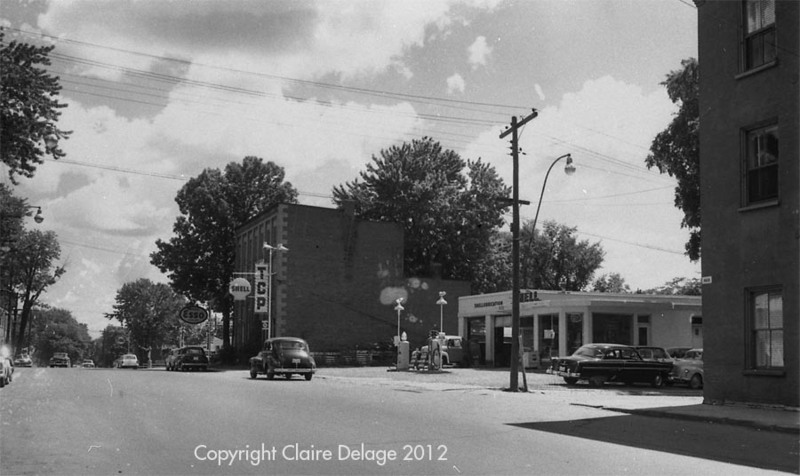 This photograph shows Main Street looking East at the corner of Hwy 31, including the Texaco and Supertest gas stations across from each other. The War Memorial is on the right in the South East corner of the intersection. 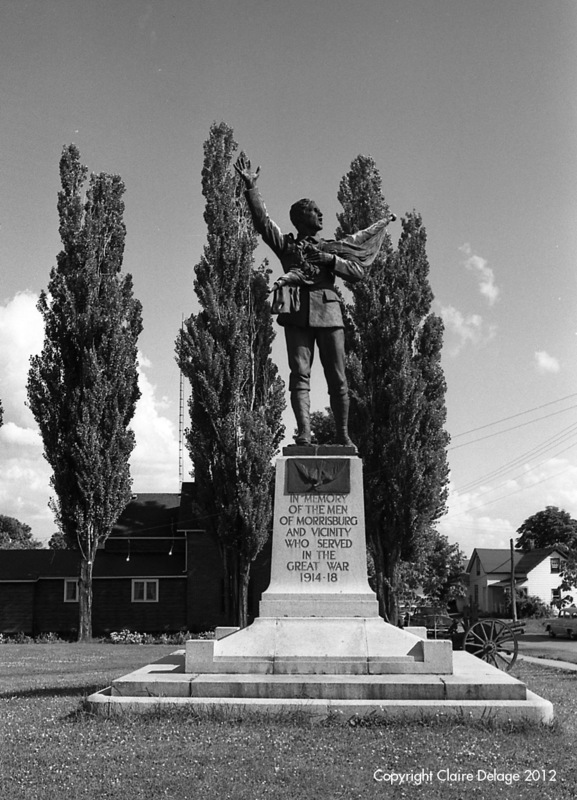 HP140-12: The War Memorial in its Original Location at Ottawa Street & Main Street. 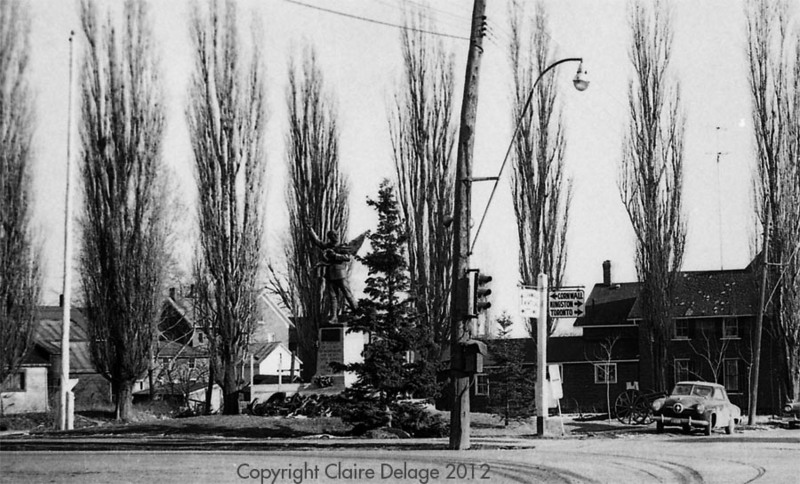 This photo shows the War Memorial Monument at the corner Hwy 2 (Main St.) and Hwy 31 in its original location. It was moved after the Seaway flooding and is now in front of the Morrisburg Justice Building on Fifth Street. HP233: The Memorial Park at the Ottawa Street, Main Street Intersection - Looking South East. 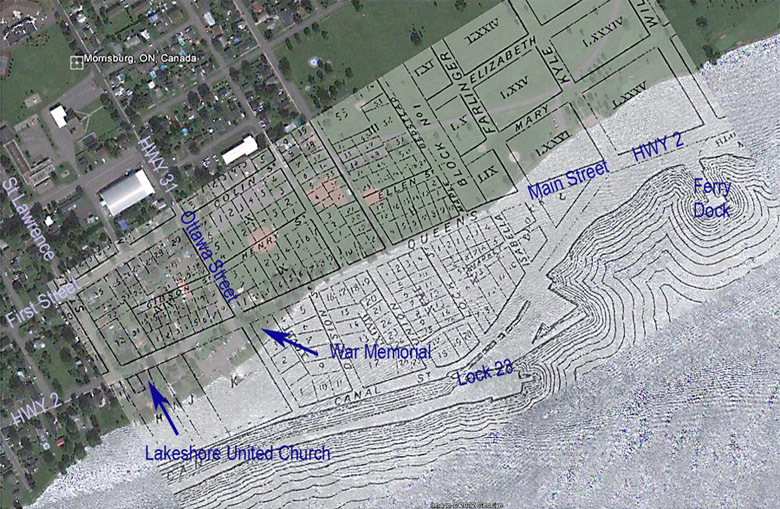 This is the park with the band stand and the war memorial on Main St. at the South East corner of Hwy 2 & Hwy 31. With the Supertest gas station owned by Harry Duvall. At left is the Morrisburg Dairy owned by Lesley Presley. 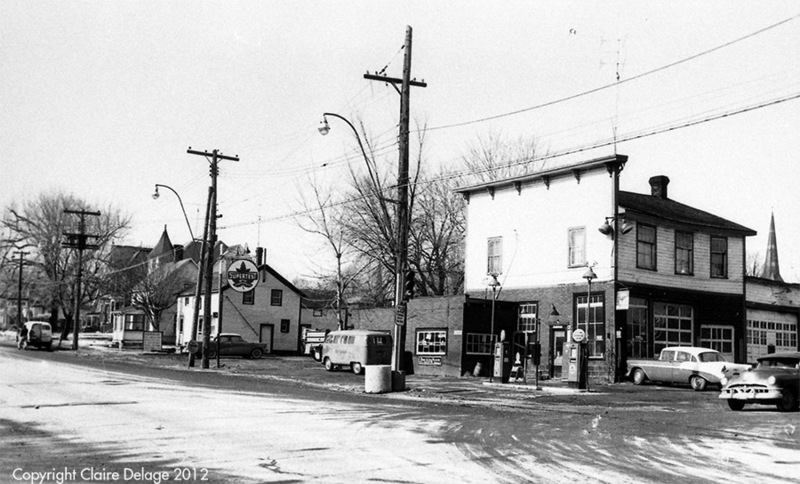 The Supertest gas station was owned by Harry Duvall. At left is the Morrisburg Dairy owned by Lesley Presley. At right is the Sunoco gas station owned by Royal Murdock. 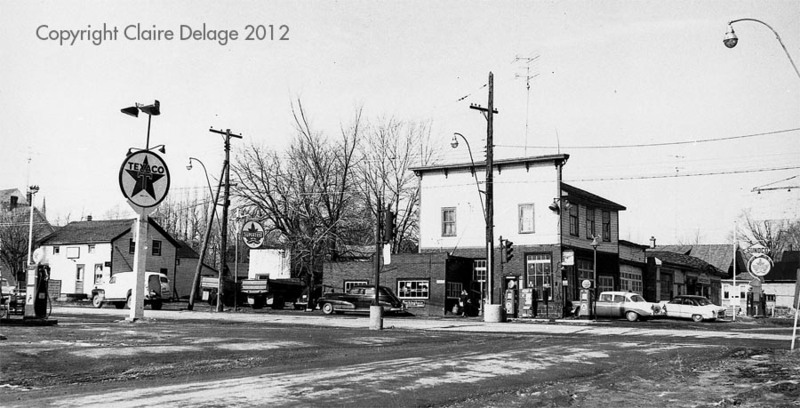 On the left is the Supertest gas station owned by Harry Duvall. Behind it is the Sunoco gas station owned by Royal Murdock. At the right is the Corner Grocery owned by Donald Beckstead. Main Street looking East from just East of the Hwy 31 intersection (from the North side of Main). 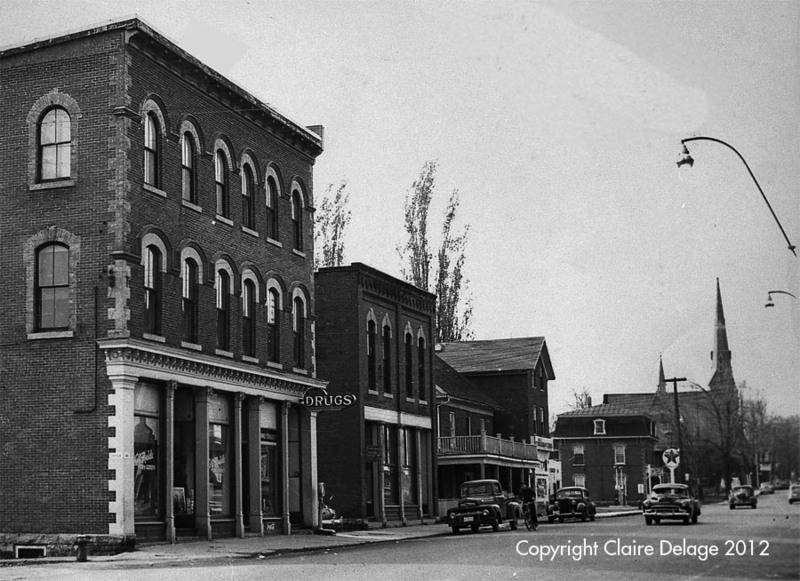 In the centre of the picture is McNeely's Drug Store on the west side of the building with Harry Meikle's General Store on the east side. 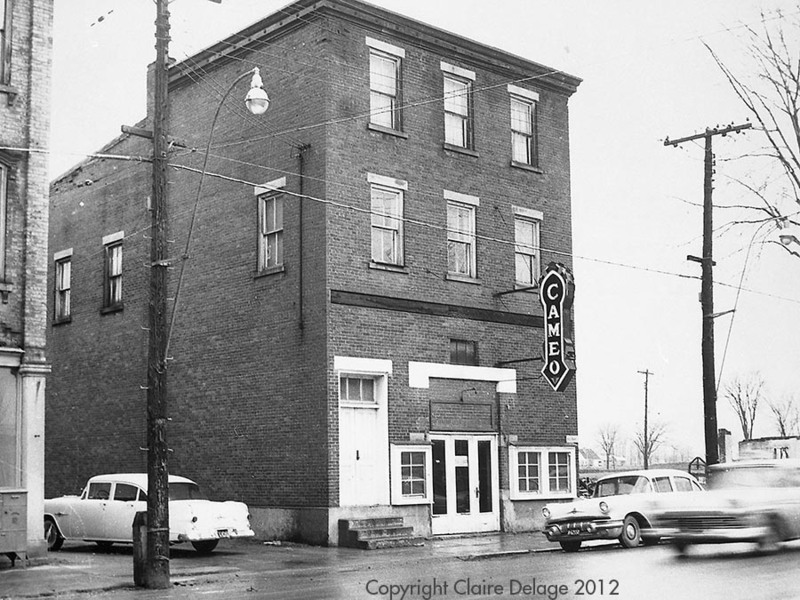 The building to the east is the Paladium Bowling Lanes (with restaurant and pool hall) owned by Henry Ing. The building to the right is Bell Telephone. Walking along a bit further East, this photo shows Main Street looking East . 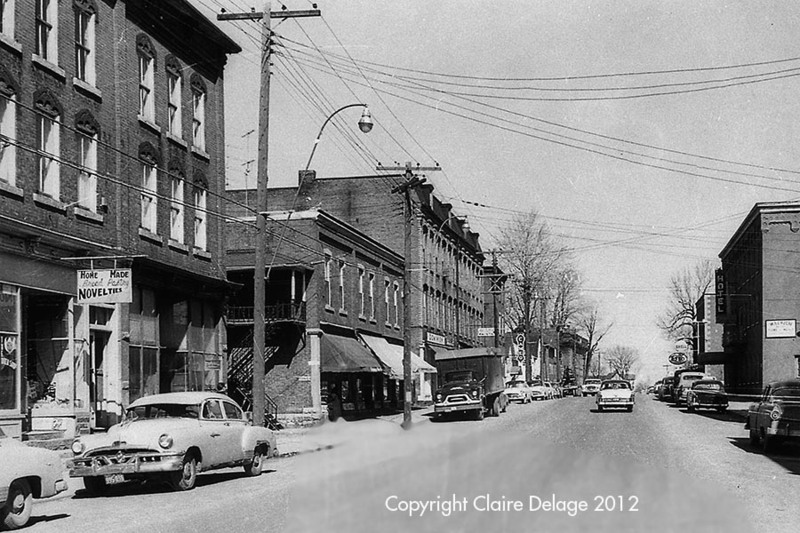 On the left (north side) is the Robert Mattice grocery store, with him standing in front in the white shirt. 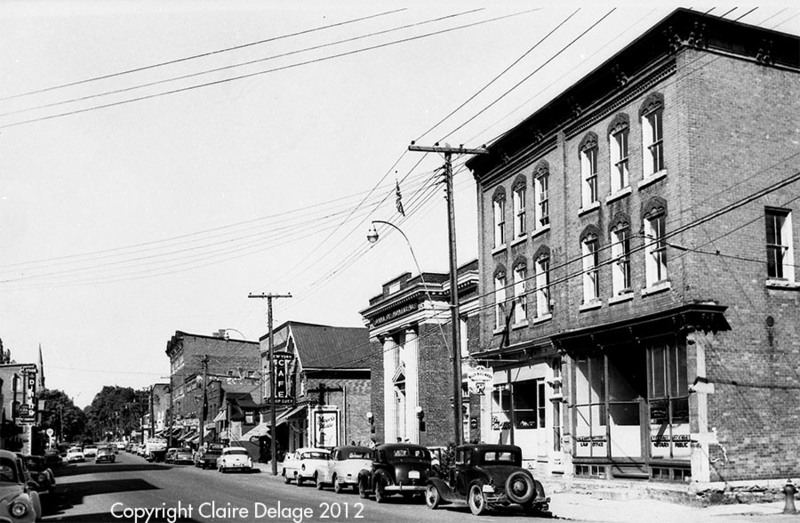 On the right (south side) is the Bell Telephone building, the McNeely drug store, the Meikle general store, Sherman's Mens & Ladies Wear and the Playdium bowling lanes / restaurant / pool hall operated by Henry Ing. 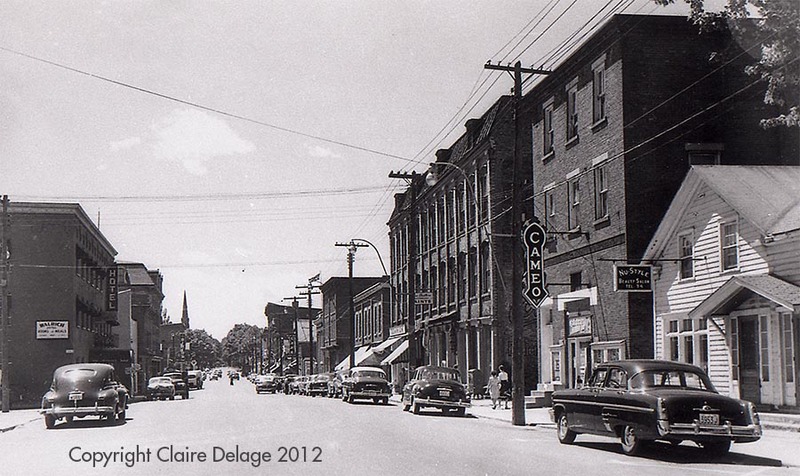 Continuing East on Main Street, on the left (north side) is the Beamish Store, Casselman's Shoe Store (Carmen Casselman), York Store, McGillis Hardware (Norman McGillis), Rexall Drugstore (Mac Wilson) and the New York Cafe. On the right (south side) is Sherman's Mens & Ladies Wear (Mac Sherman) and the Playdium Bowling Lanes. Further East along Main Street, on the north side (left) is the Bank of Montreal and the Bakery. 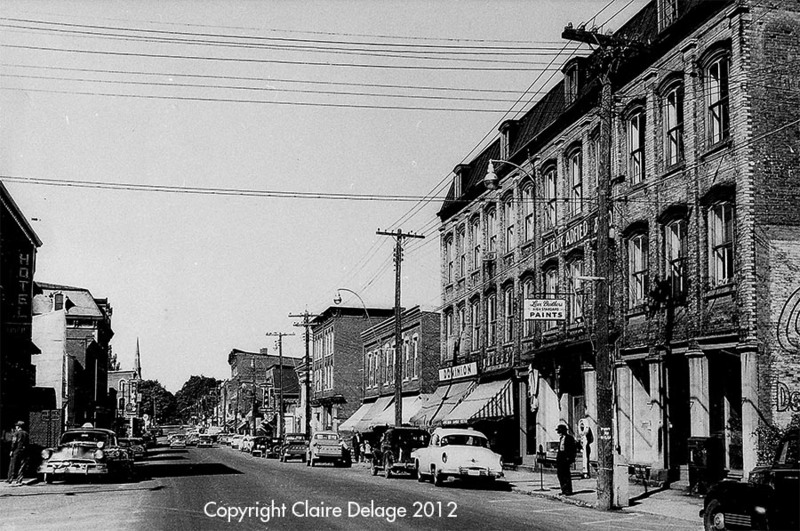 On the south side (right) is the Men's Clothing Store owned by Graham Casselman and the Walrich Hotel (Walter Vinet). The Bank of Montreal building from the North side of Main Street. 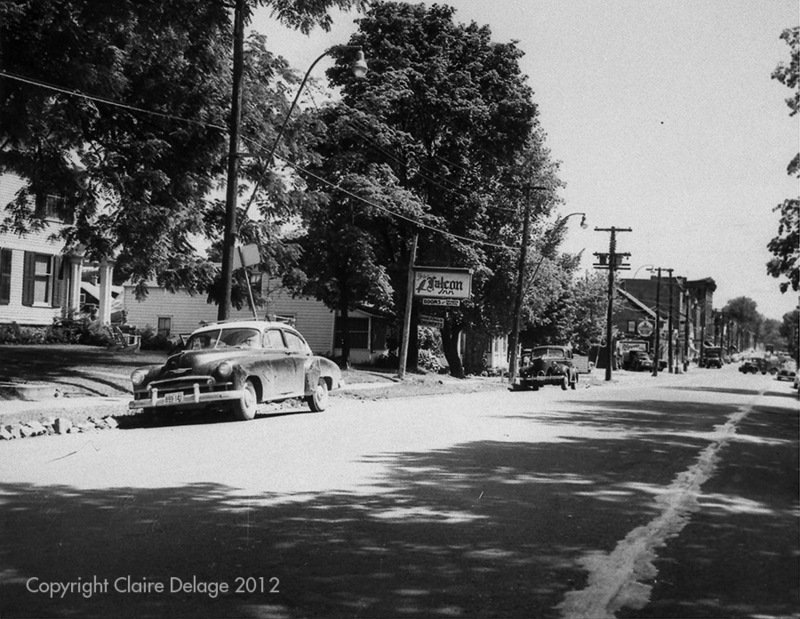 Continuing down Main Street looking East, with the Bakery, Gift Shop and the Cameo Theatre. 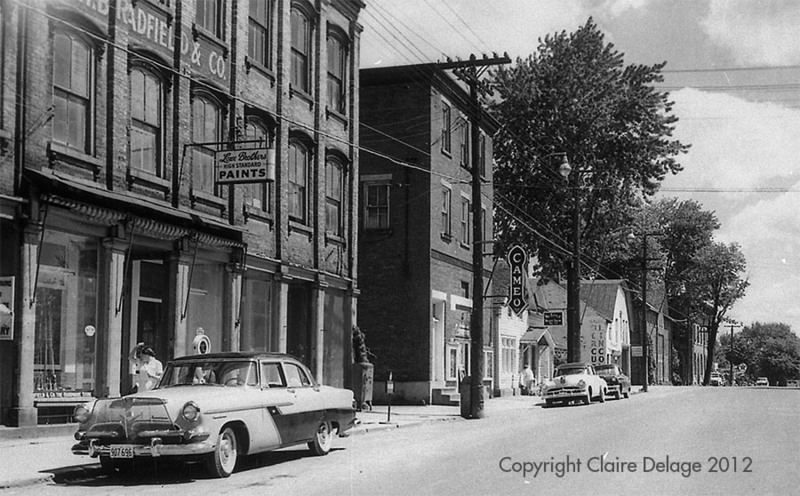 Main Street looking East - with Bradfield Hardware, Post Office, Cameo Theatre, "NuStyle" Beauty Salon (Gertrude Aikman) and Coughtry's Garage. 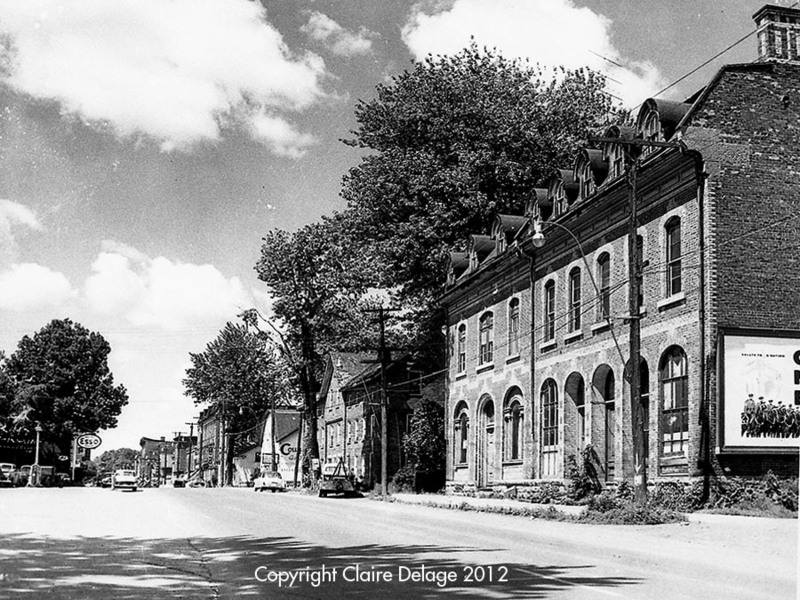 The Cameo Theatre - Note that, in this photograph, all the buildings to the East of the theatre have been demolished in preparation for the Seaway flooding. Further down Main Street looking East onto the South side of the street – with the Shell Gas Station and the Esso Gas Station (Ford Dealership). 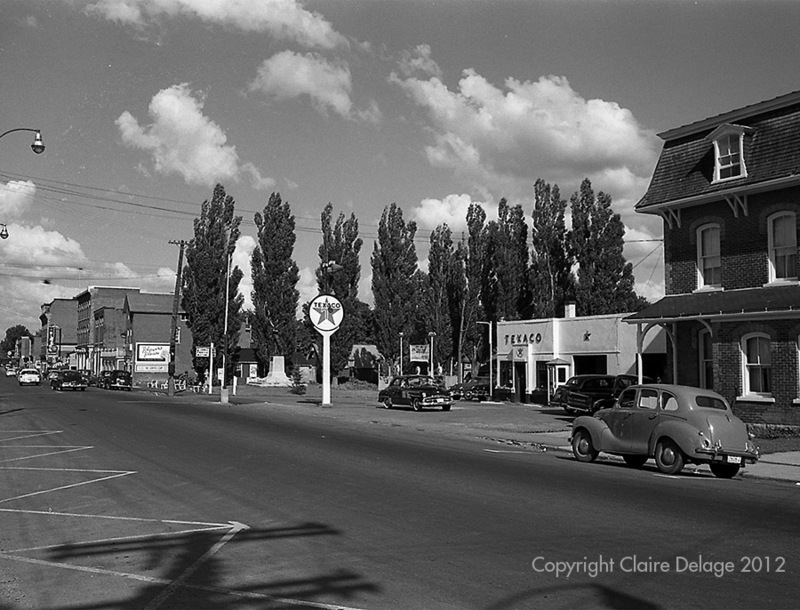 Main Street (Hwy 2) looking East at the East end of the town - with the Cougler's Locker plant and the Texaco Gas Station (Stewart Hope) on the North side of the street. The Canadian Customs and ticket office for the Morrisburg/Waddington ferry at the east end of Main Street. 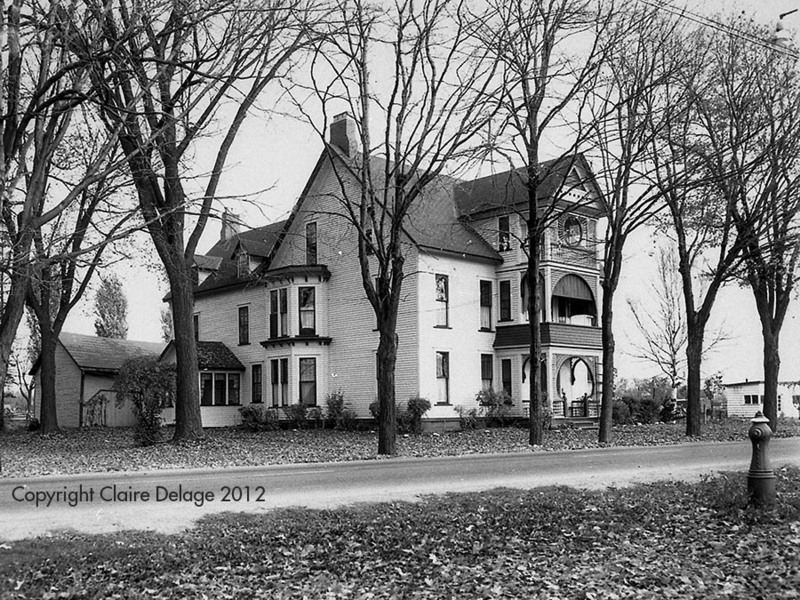 The Rosedale Inn Tourist Home at the East end, on the South side of Main Street with the Stone house owned by Pearl Fetterley (married George Beavers) - purchased 1948 – 1958 by Arthur & Doris Hill. Turning Around at the East End of Main Street and Heading West Back Into Town. 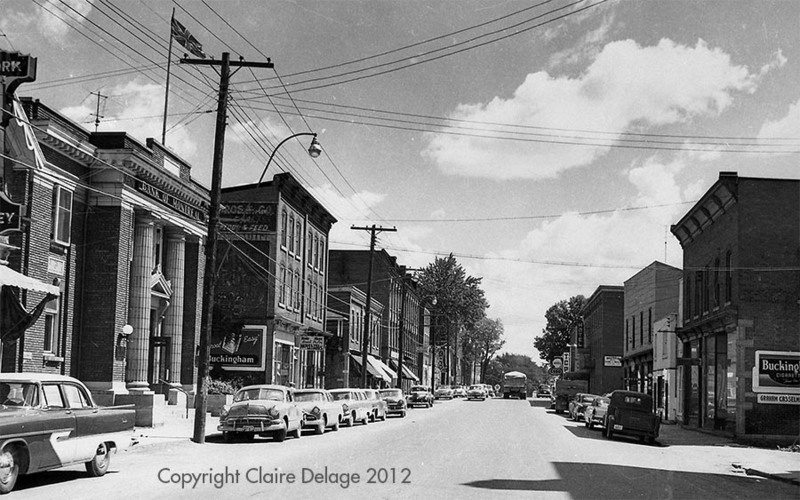 Main Street looking West - with the old Molson Bank building on the right on the North side of the street. HP28: NuStyle Beauty Salon & the Cameo Theatre. 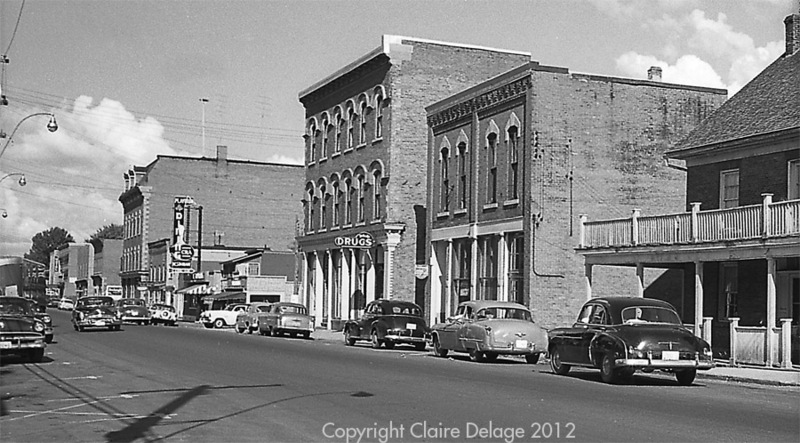 Main Street looking West with the NuStyle Beauty Salon (Gertrude Aikman) and the Cameo Theatre on the North side of the street. 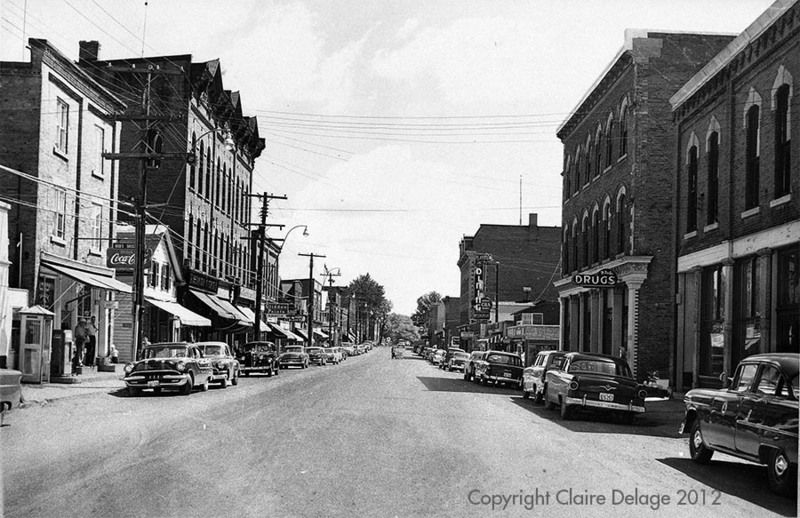 Main Street looking west with the Post Office, Bradfield Hardware and the Dominion Store (Grocery) on the right, on the North side of the street. Walking further West on Main Street. 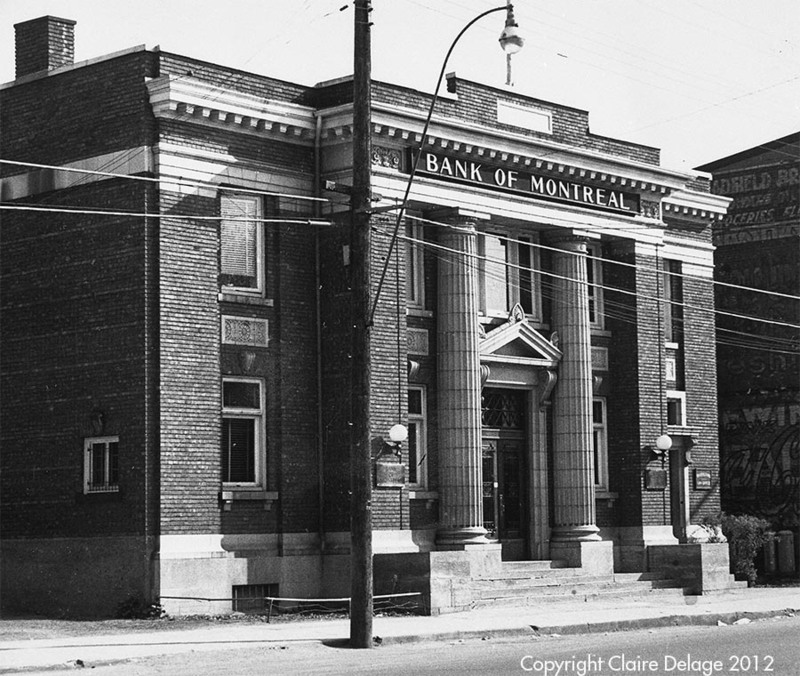 See the Law Office, Billiard Parlour, Bank of Montreal & New York Café on the North side of the street. 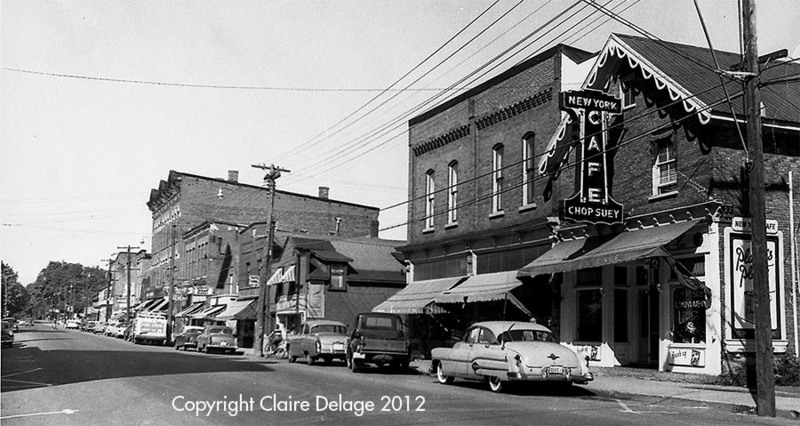 Main Street Looking West, with the New York Café (Willie Hoy) on the North side of the street. 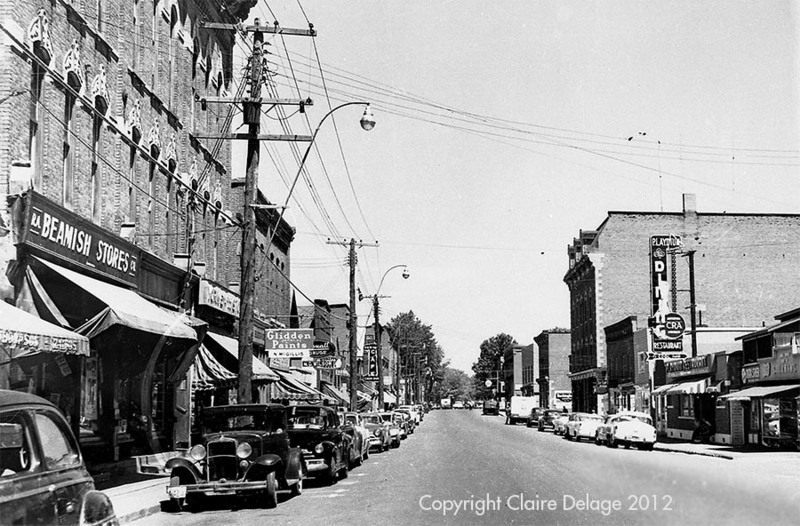 Continuing West on Main Street - with Ford's Jewellery Store, Family Outfitters (Men's and Ladies clothing) (Saul Rosenfield), Quality Meat Market (Roy Marcellus), Rexall Drug Store (Mac Wilson) and McGillis Hardware (Norman Mc Gillis) on the North side of the street. 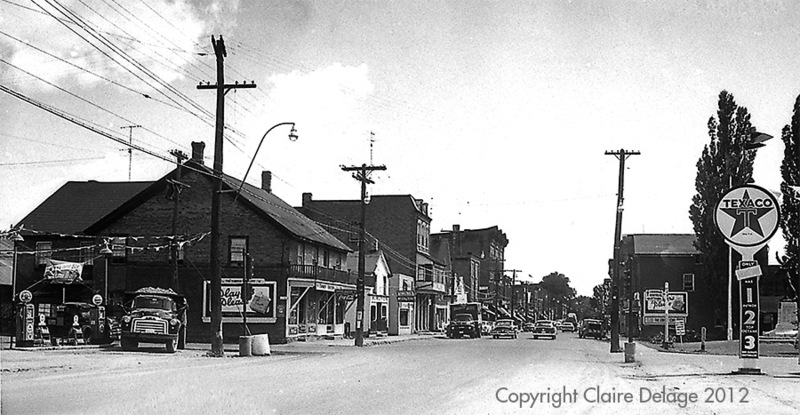 A little further West on Main Street, looking West - with McGillis Hardware, York 5c to $1 Store, Casselman Shoe Store and the Beamish Store on the North side. 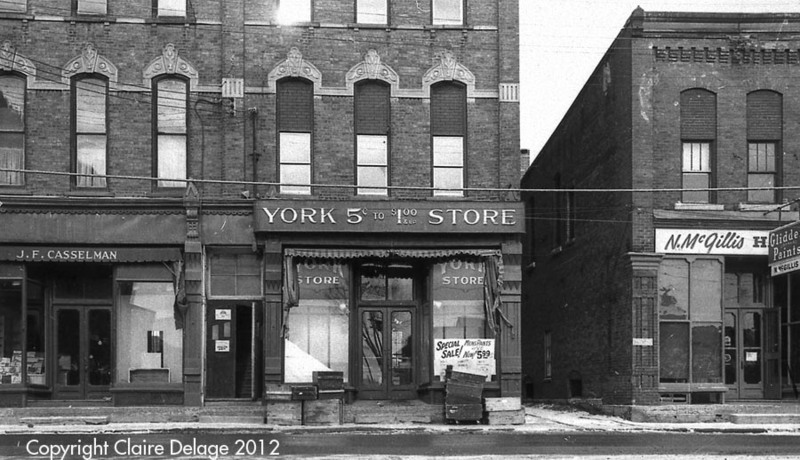 Stores on the North side of Main Street - John Casselman's Shoe Store, York 5 Cents to $1.00 Store, McGillis Hardware (Norman McGillis). 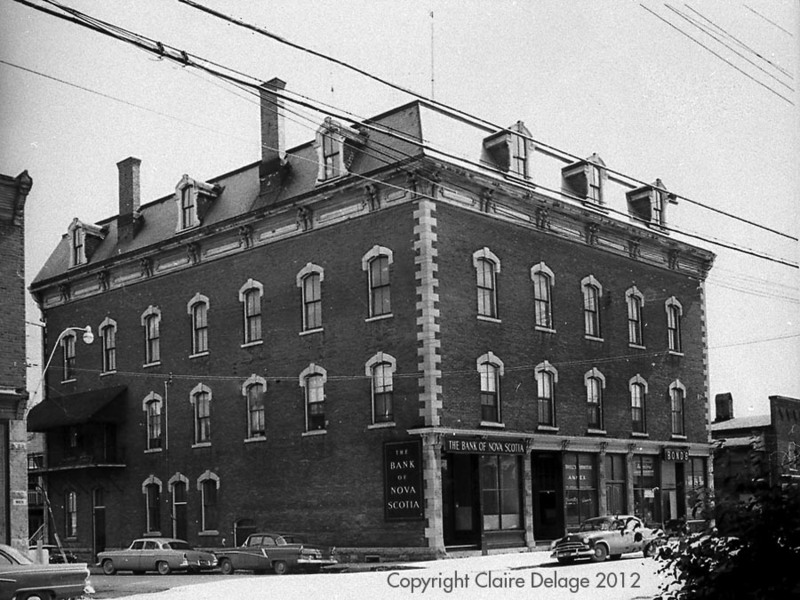 The Music Hall was on the 3rd Floor of the Bank of Nova Scotia building on the South side of Main Street. 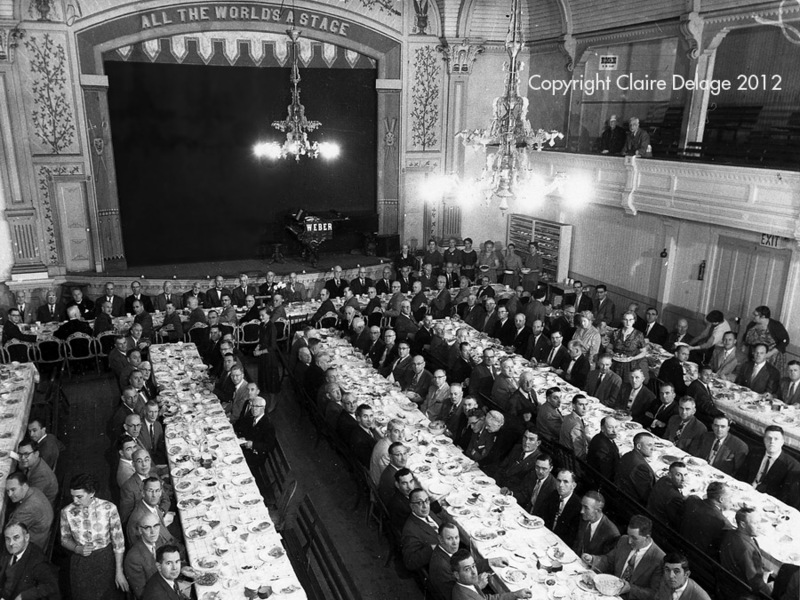 Canadian Club's 1950s final dinner at the Music Hall (Inside the Bank of Nova Scotia Building on the South side of Main Street). Taken from the 3rd floor of the music hall with the grand piano on the stage. "All the World's a Stage" is painted above the arch. Live musical performances were held here. Main Street looking West from just East of the Main Street/Ottawa Street intersection. 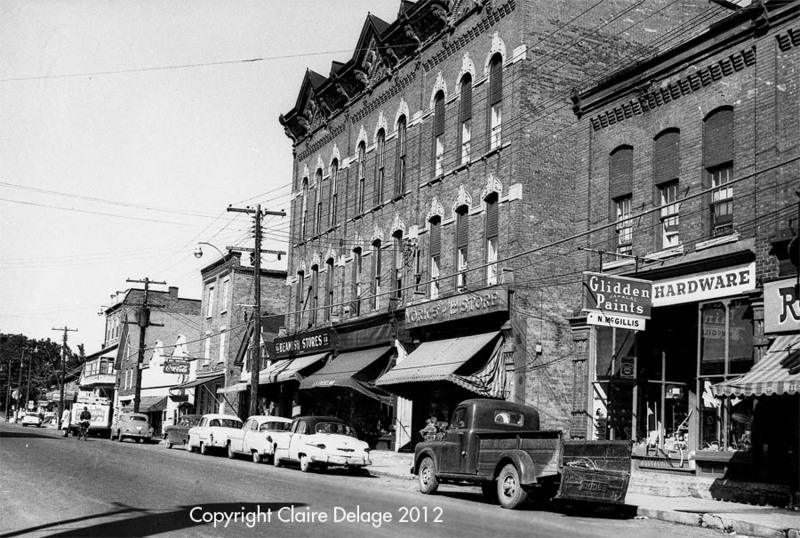 In the foreground on the South side of the street is the Meikle Block with Meikle General Store, McNeely Drug Store and Bell Telephone. Further West you can see the Lakeshore Drive United Church (where we started).